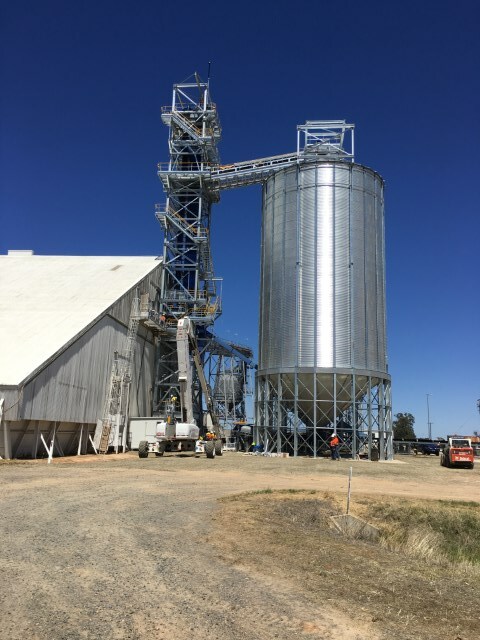 Allied Grain Systems started engineering the plant upgrade back in 2016. The key design point was grain flow from anywhere to anywhere. The central point is the bucket elevator that was extended by 11 meters in height. Also, a new head section, belt and motors were installed to increase the capacity from 400 to 550 tonnes per hour. 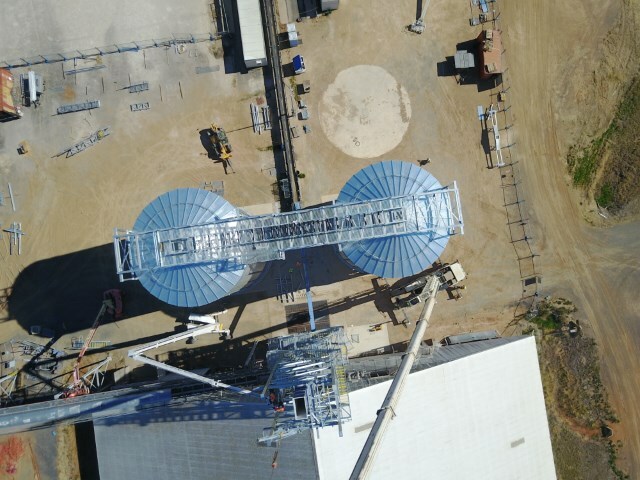 From the bucket elevator discharge the grain can be directed to any other location on site; to the new storage bins, existing shed, existing bunker, truck loading chute or the garner bin over the rail line. 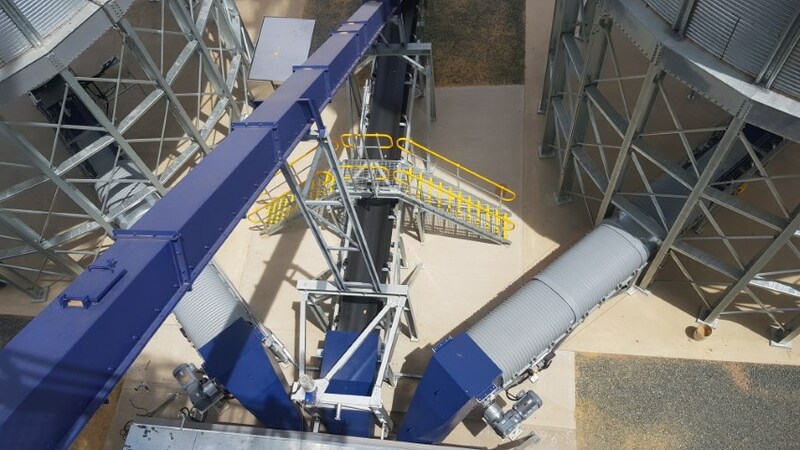 In similar fashion, the bucket elevator can be fed from many sources; the bulk storage bins, drive over hopper pit, bunker or shed. To direct the grain flow into the desired destination, multiple pneumatic diverter valves and conveyors and sensors were installed to facilitate easy operation, where the operator chooses source and destination and valves and conveyors will start in a predefined sequence and stop when desired amount of grain has been transferred. 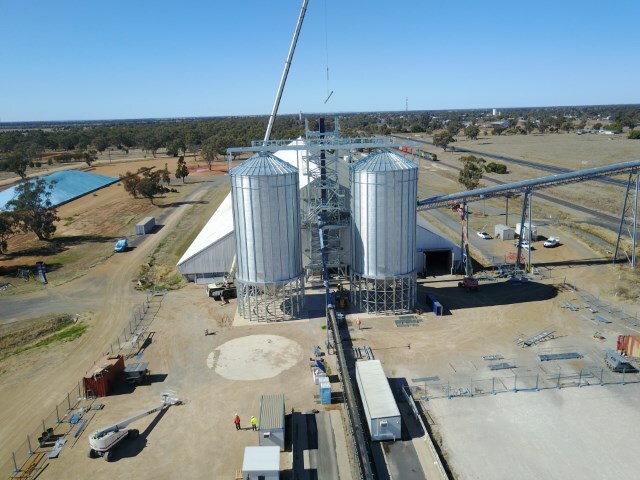 In May 2017 the first Allied Grain truck arrived on site and the site works begun by marking out the silos on the ground and soon after the excavator took its first bite off the ground. After silo foundations were finished and the concrete had set, silo team arrived on site and started erecting the silos, ring by ring. 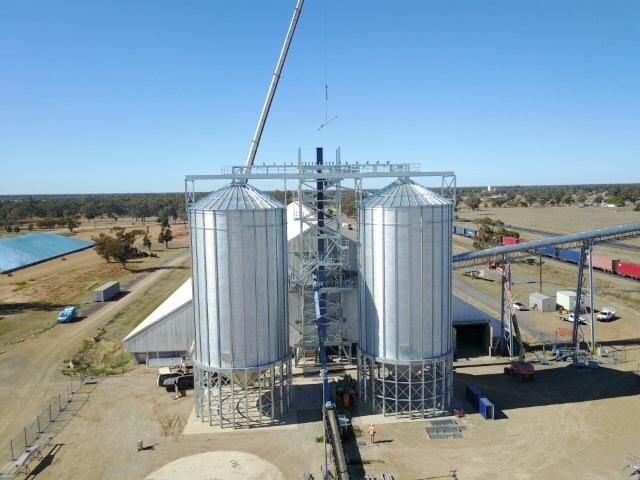 Meanwhile another team had built the silo base and it was time to marry the silo barrel to the base and for this, a big crane and steady weather was needed. One full day was spent by our experienced crew to set up for the big lift. 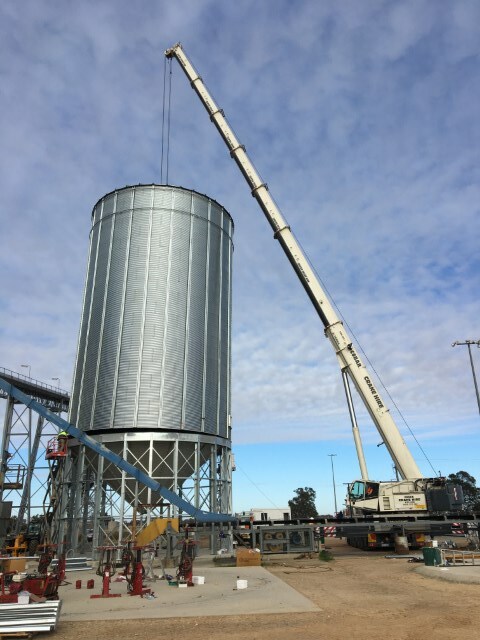 The next day the crew and the audience had a sigh of relief as the silo was lifted onto the base and securely bolted down before morning tea. Another major operation was the extension of the bucket elevator. Existing head was bolted off and lifted down, new sections were added, new head section was installed together with a gearmotor. A new tower was built to get safe access to the top. 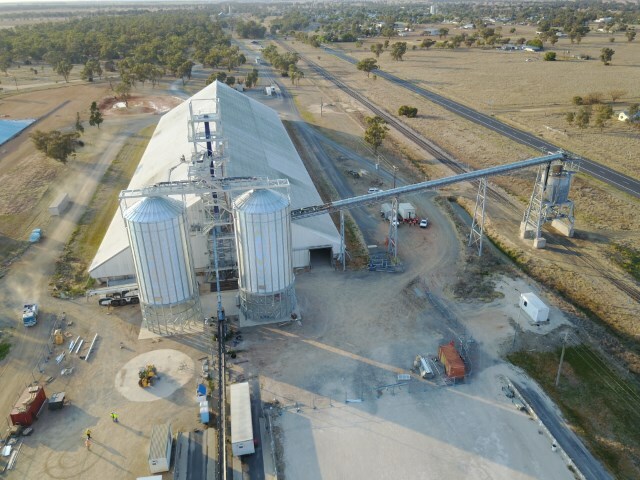 Conveyors and walkways were built, electrical wiring was drawn and connected, and eventually all equipment was installed and commissioned after nine busy months with Allied Grain Systems team and subcontractors on site. 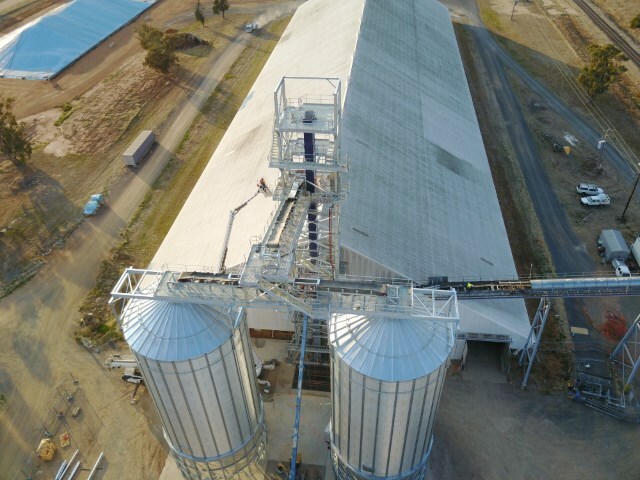 As part of the commissioning, the two 1500 tonne silos were fully sealed and tested to exceed AS2628-2010 criteria by a factor of three. 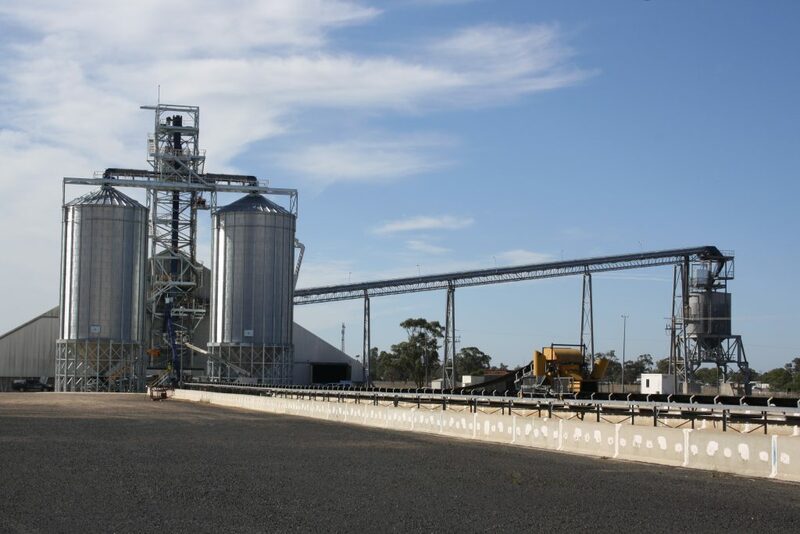 The biggest benefit for GrainCorp on this upgrade came from the significant reduction of the train loading time. 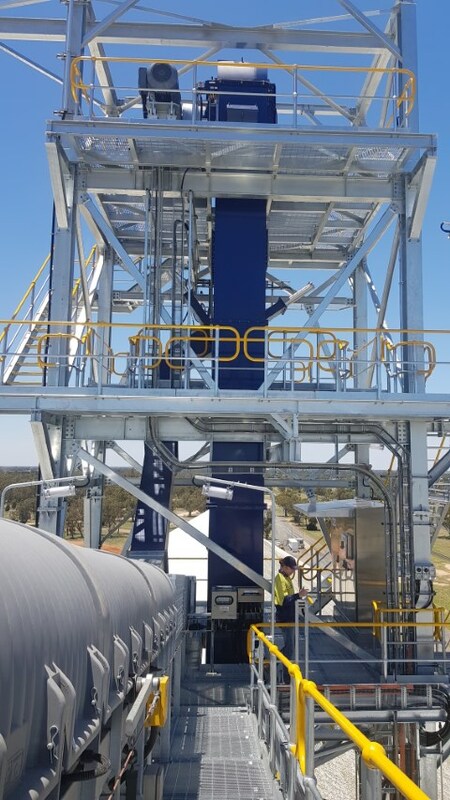 This can be accredited the remote control operated high-capacity train loading chute that Allied Grain Systems had designed and installed. 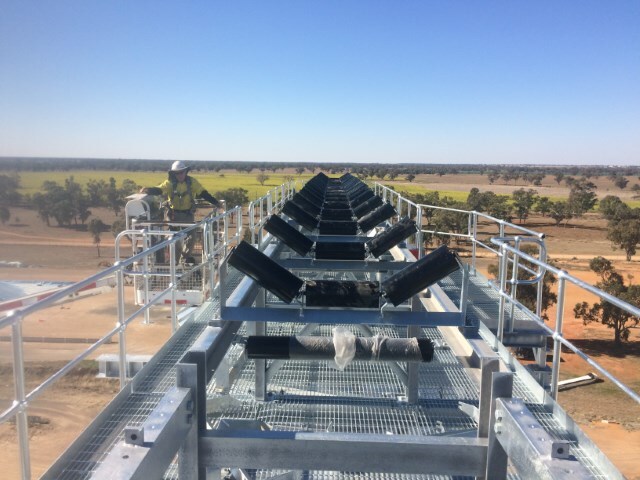 The chute was commended for by GrainCorp whose representative said “This is the best train loading chute of all of our sites so far”. The main challenge to overcome when the pneumatic operated chute was installed under the existing garner bin was that there was only a window of few hours between trains on the main line. 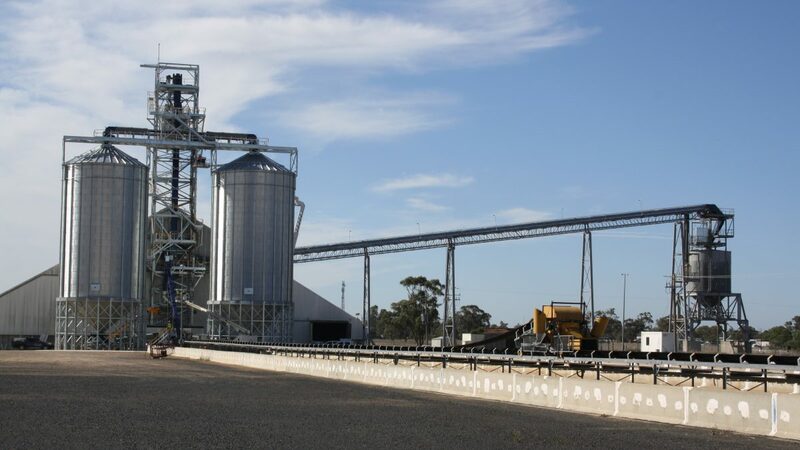 The first train was loaded on the 7th of December 2017 and 23 carriages were filled with grain in 4 hours whereas with the old system it took more than 8hrs. 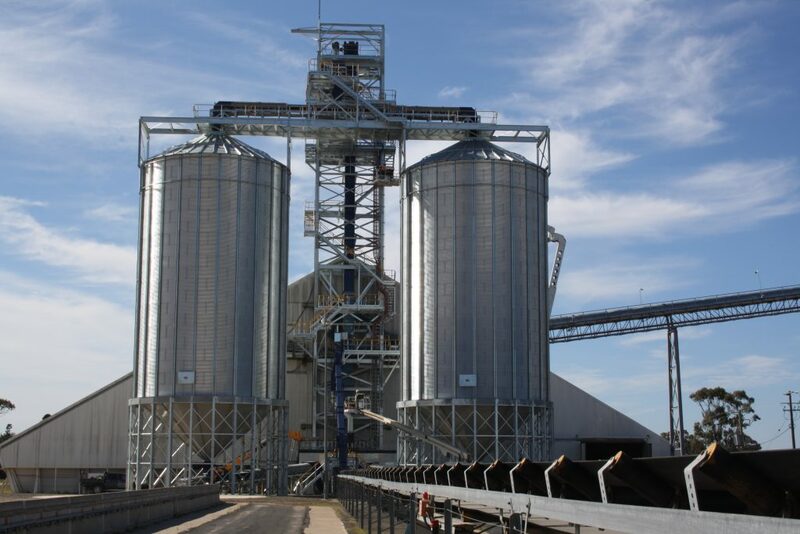 This event marked the Practical Completion for Allied Grain Systems.